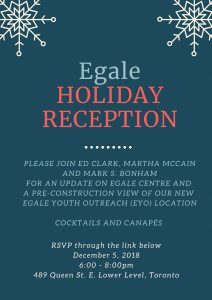 Join myself and Campaign Co-chairs Ed Clark and Martha McCain for a personal update on the construction of the new LGBTQ Homeless Centre – The Egale Centre. Under construction near the corner of Dundas and Sherbourne Streets in downtown Toronto, this $16 million, 35-bed housing unit is Canada’s first inclusive centre to focus entirely on the LGBTQ homeless population by combining counselling services with transitional and emergency housing. One in four homeless youth in the city identify as LGBTQ. With a planned opening in the Spring/Summer of 2019, this new facility will be a great help to the community. More information on the Egale Centre can be found HERE.